Would you like a FREE poster to promote your pop-up gallery? Just click the poster above, and you can download a poster already for you to print. All you need to do is insert your gallery name. There is a poster for Artists, and another for Galleries. Alternatively, we will create your bespoke, professional poster for just £5 and it will include a QR code that smart phone users can use to access your pop-up immediately! Order Now. 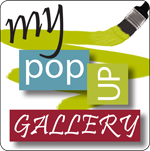 Do you want to further customise your Pop-up Gallery? To create your own HTML coding? Simply click the folder above to download the program. Use these tools to create HTML which you can then simply cut and paste into your Gallery, or even listings! If you create documents, such as Artist Statement; Biographies; Art Work descriptions etc, it can help to protect them by publishing them as non editable PDF files. These documents are read by the free Acrobat reader installed on many computers. PDF software can be expensive, however we highly recommend this free version. Click here for more information (look for Freeware) or click here to download NOW! If you don't have your own website you will need to upload your images before you can add them to your Pop-up Gallery pages. To do this we recommend free image hosting with Photobucket. For more information and detailed instructions read our FAQ. Go to your pop-up web site, click in the address bar at the top of your browser (the URL), select the text (highlight it all) and copy it. Then paste it into the box below.